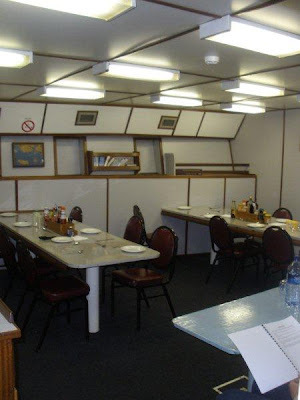 Having never been on ship before, I had no idea what to expect when I boarded the Algoa. 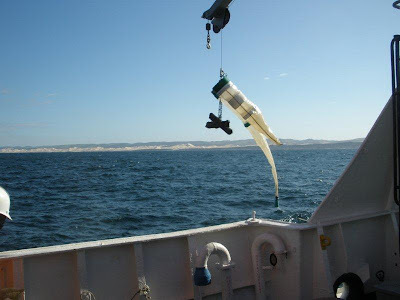 For the next thirty days I would be out at sea doing research with 18 other scientists from around South Africa. 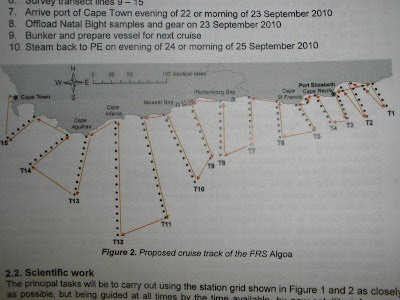 We left port three days ago on our course from Port Elizabeth to Cape Town. We a running a series of transects along the coast ranging from 200 miles off shore to 20 miles off shore. Our first day out was a bit unnerving as the seas out here are quite rough, especially for a first timer like myself. But after the initial bout of seasickness that lasted for about a day, I started to get comfortable with the rocking motion of the boat. In fact, I rather enjoy it now – it’s quite soothing, especially when going to bed. We finished a near-shore transect and are currently close enough to get internet signal, however for the remainder of the cruise the boat will be too far off the coast to pick up signal, thus I will try to post as many details as I’ve got now. There are two shifts on the boat – both being 12-12. I opted for the midnight-noon shift, I would rather be sleepy early on in my shift, then awake when the sun comes up instead of being awake during the day part of my shift, then sleepy as night falls. And plus, sunrise at sea is absolutely lovely so this way I get to witness it every day I’m out here! Needless to say the hours are very long and can be quite tiring, but the work we are doing is fascinating and the other researchers are all really interesting to talk with. The weather so far has been quite tame with waves averaging about 10 feet, but I’ve been told to expect some major wind tonight and some serious storms next week. Starting on Monday we will be ranging farther south to latitudes of 37°, just shy of the ‘roaring fourties’ where wind forces are known to be extreme and storms are practically guaranteed. I’m a bit curious to see what life is like on the rough seas so I’m kind of excited for next week. All I have in my mind at the moment are scenes from the movie ‘The Perfect Storm’ so hopefully things to get quite so out of control, but I still think it should be quite an adventure! 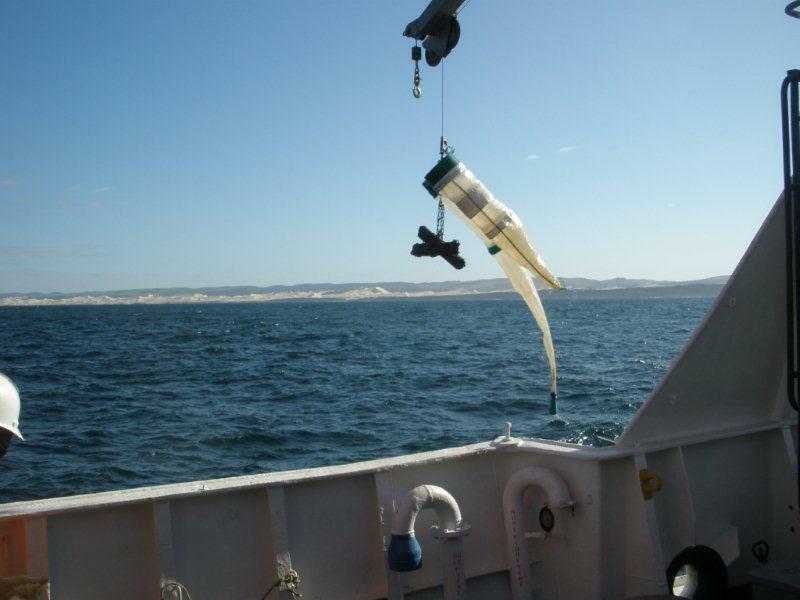 Studies of coastal seas off southern Africa have to a large extent been dominated by the use of satellite remote sensing, however the vertical structure of the water column, organisms being carried by the water, and local ecosystems can only be studied in situ on research cruises, such as this one on the Algoa. I am helping out with a number of studies while on board the cruise, namely projects that are being carried out by Rhodes University, but when other researchers need an extra hand I am available for them as well. There are a number of biological objectives that we are looking at through this research: investigating the spatial dynamic of planktonic communities, determining trophic relations between different escosystems, characterizing the SPM (suspended particulate material) component using stable isotope ratios and fatty acid profiles along the coastline, and finally collecting larvae of the indigenous mussel Perna perna to investigate the pelagic distribution of the species and profile larval densities and distribution as well as examine near-shore densities of larvae with respect to coastline topography, specifically of bays and capes. 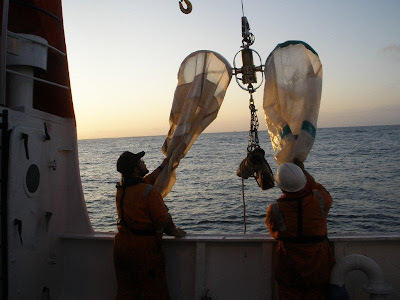 There are other researchers on board who are collecting distribution and abundance data on seabirds and cetaceans (whales), but I am not involved in their projects. 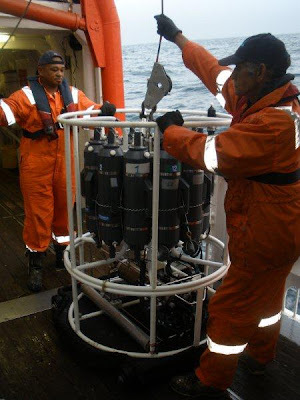 We have access to some remarkable scientific equipment on board the ship, and most of the work I am involved with requires the use of a CTD, larvae pump, and bongo tow. 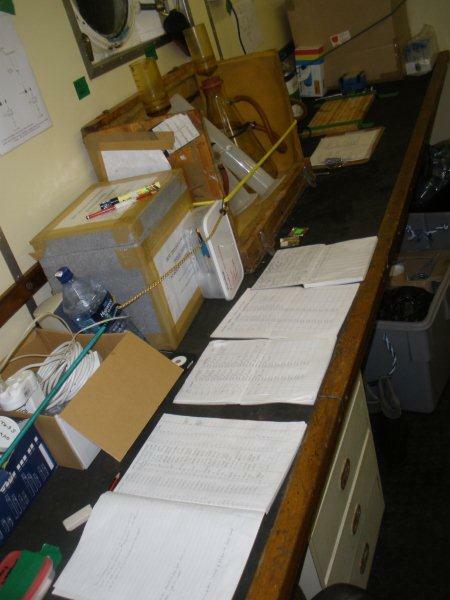 There are a number of stations along each transect line, and at each station we gather samples using those devices. The CTD is basically a series of bottles mounted on a frame that can be remotely triggered to close and collect water samples at any depth up to 1000m. 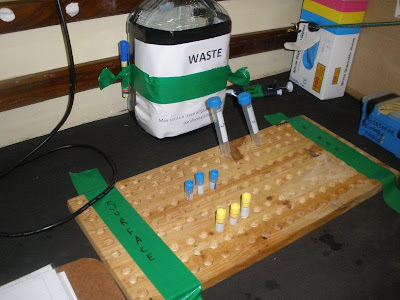 Water is often collected and compared at various depths including deep (1000m or bottom if shallower), F-Max (a vertical layer with the highest composition of chlorophyll) and shallow. Once collected, the water is tested for various parameters including dissolved oxygen, nutrients, phytoplankton and chlorophyll. A bongo is basically a large net of a certain mesh size (we use two, with mesh sizes of 300 micrometers and 200 micrometers). The bongo is used for zooplankton sampling and is towed from the rear of the boat at various depths to compare planktonic communities throughout the water column. 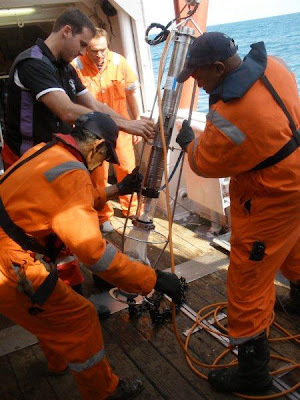 A submersible plankton pump with 60 micrometer mesh is used to collect mussel larvae, and at each station we sample three depths – surface, thermocline, and deep (200m max). Micro-organisms are sampled by collecting water samples at various depths (using the CTD) in cryovials prepared with glutaraldehyde and paraformaldehyde and place them in liquid nitrogen on deck for further analysis when we get back to shore. 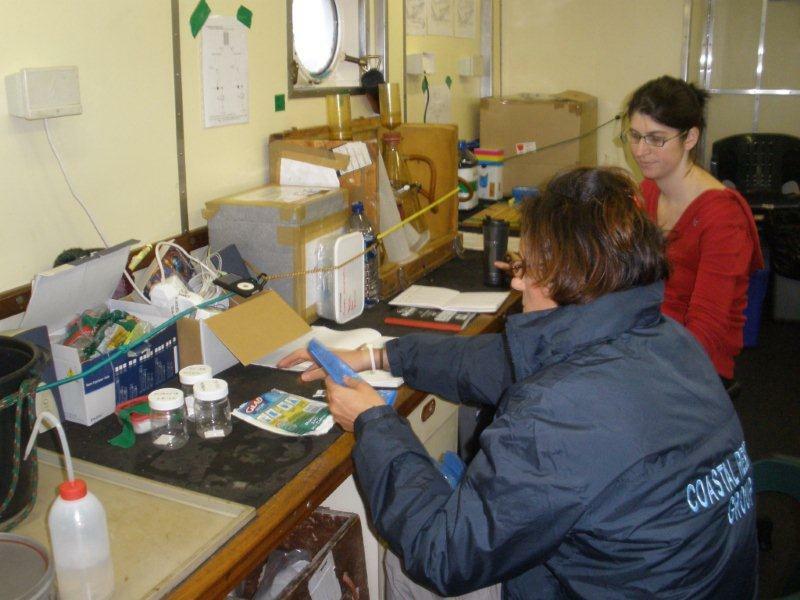 Finally, we sample SPM for isotopes and fatty acids by filtering water from various depths and store the samples in an onboard freezer set to -80° C.
Well, that’s basically the rundown of the research I am involved with onboard the ship. It can take anywhere from two to three hours to collect all the required samples at each station along the transect (with two of us working per shift). 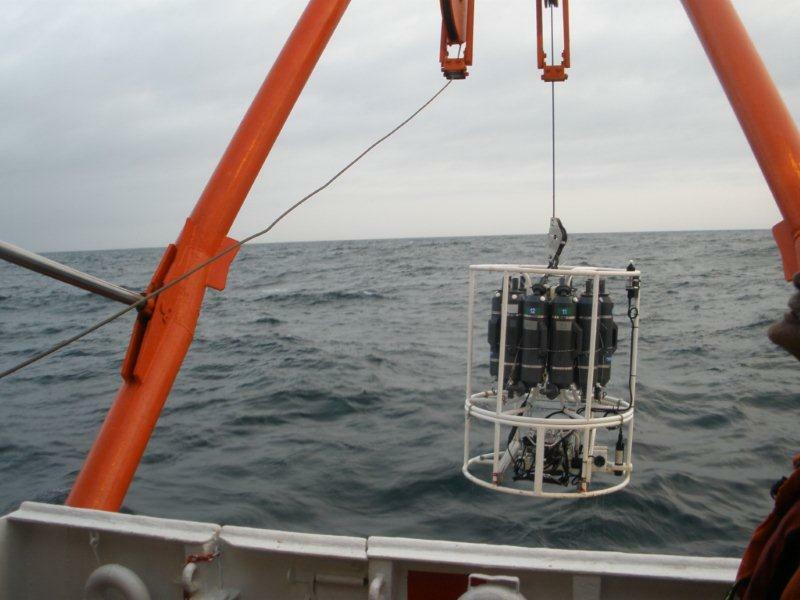 After all the samples have been collected, we move forward to the next station, often a 30 minute - 1 hour steam at 10 knots. The work is tough but it is very interesting and therefore goes by rather quickly. In fact, I think the hardest part of the day is trying to go to bed at 2pm to prepare for my midnight shift. Yes I am often tired from the night before, but still, it’s the middle of the day and my body isn’t used to going to bed so early. Mealtime is also very strange when working from midnight to noon. The standard meals on the boat are normal breakfast lunch and dinner, but when working through the night I often eat two or three times during my shift as well. Then I still eat breakfast, and because I get off at noon I end up eating lunch as well. And if I try to go to bed in the middle of the day, I end up hungry around 6pm because I’m so used to eating dinner, so I often end up eating dinner as well, bringing my total meal count for the day up to 6! Yikes, not good, especially considering the fact that we don’t get any exercise when stuck on a boat for a month. By the time the bad weather hits next week, maybe I’ll have put on so much blubber that it wouldn’t even matter if I tip overboard, I would simply float back to shore effortlessly! Speaking of which, last night around 3am the other researcher and I were pulling in the bongo near the edge of the boat when a rogue wave hit the ship and nearly sent both of us overboard. We were both bent over, pressed against the side holding on for dear life with the sea about two feet from our faces. We laughed it off, although I’m not sure we would have done the same had we actually fallen off… Makes me wonder what next week will be like when the real weather hits! Well, life on the boat is great. In fact, I love it so much that I will strongly consider looking for more research cruises – it’s a fun experience and I quite like being out at sea. The hours are long, living spaces are small and take some getting used to, and the work is hard - but the reward is spectacular…every morning I am on deck at sun-rise, whales breach in the distance, seals swim up to the boat in curiosity, sea birds fly around us in every direction – it’s unlike anything one could experience on land. Well, I’d better get to bed, my shift starts in a few hours and it’s supposed to be a windy night tonight, which means the work will be that much harder as all our equipment flaps around in the wind. Out to sea we go! 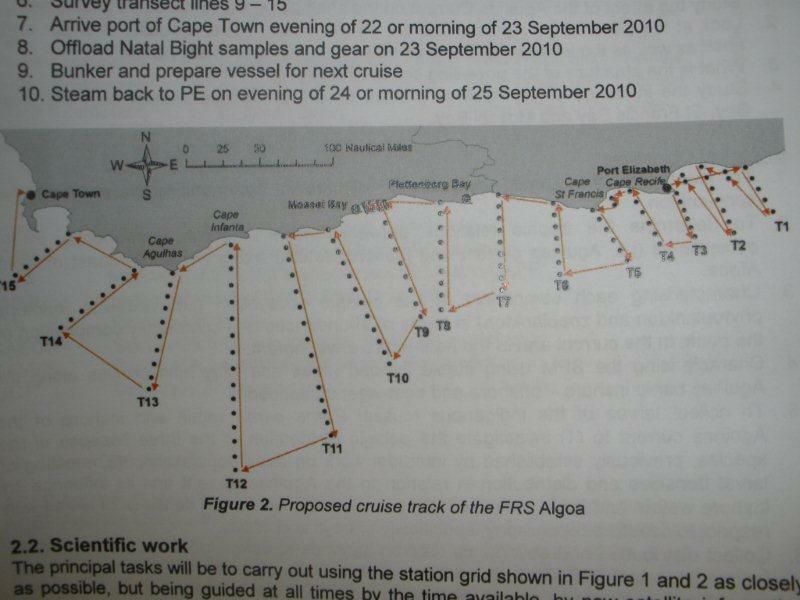 This shows the stations and transects we will be running along the coast.